The new, big kid on the block is back and ready to take you for a ride in efficient, Earth-saving comfort. And who is this always-do-well? It's the 2017 Toyota Prius V, and it is here get you excited about hybrid vehicles. With EPA-estimated fuel economy ratings of 43 miles per gallon city and 39 miles per gallon highway (41 miles per gallon combined), the 2017 Prius V easily qualifies as a Super Ultra Low Emission Vehicle (SULEV), which will make you feel great about your daily commute. The cabin and cargo space in the 2017 Prius V will ensure that your family, friends, pets, and all of your essential cargo gets to where you need it to go. Come to Lipton Toyota right now and explore the very spacious and stylish 2017 Toyota Prius V. You can find Lipton Toyota at 1700 West Oakland Park Blvd in Ft. Lauderdale, FL and we have a wide selection of new Prius V models for you to explore. Keep everyone happy and content on any length of commute in the spacious and passenger-friendly cabin, and stay connected with Toyota's awesome Entune system and available app integration. If you want a car that is dependable, fuel-wise, and safety-minded and that offers an easy-to-configure cargo space, efficient performance, and a comfortable interior, then you should head straight to Lipton Toyota. Our Fort Lauderdale Toyota dealership has been serving shoppers from Deerfield Beach, Weston, Hollywood, Dade County, and Broward County for many years, and we have a wide variety of new Toyota hybrid cars in stock and waiting for you to test drive. Find your new Toyota Prius V and have a hassle-free dealership experience at Lipton Toyota. If you are looking to shrink your carbon footprint and save money at the gas station, consider a new Toyota hybrid vehicle for your next car purchase. Hybrid cars utilize less fuel than conventional vehicles, and on top of that efficient performance, the 2017 Toyota Prius V will coach you to drive more efficiently with its innovative ECO Score indicator. The ECO Score indicator will rate your driving on a scale of 1 to 100; the closer you get to 100, the better and more efficiently you are driving. The Prius V also features a three-mode drive select system that will help you get the most out of every tank of gas. The three modes are: ECO mode, which increases hybrid efficiency by reducing the throttle sensitivity and feedback; EV mode, which switches the Prius V to all-electric operation for up to one mile; and POWER mode, which delivers more throttle sensitivity, faster and stronger throttle response, and allows you to use the Prius V's engine to its full potential. The impressive powertrain under the hood of the 2017 Prius V hybrid is a combination of a 1.8-liter four-cylinder gasoline engine, a sealed nickel-metal hydride battery pack, and a permanent magnet AC synchronous electric motor. The combined components of the Prius V's powertrain produce 134 net horsepower and 258 net pound-feet of torque. The efficient powertrain sends power to the front wheels of the Prius V via an electronic continuously variable transmission (ECVT). The stylish exterior of the 2017 Prius V isn't just for looks and for good reason; thanks to its innovative exterior design features, the Prius V is more aerodynamic than ever before. The Prius V was given a mid-cycle refresh a few years ago, which included slimmer headlamps and an updated hood that accentuate the sharp grille and dramatic sidelines on the Prius V's sheet metal. The Prius V got a wider, lower stance emphasized by thick cutaways in the body panels as well as fang-like slits in the front fascia that also work to underscore the athletic nature of this efficient hybrid. The 2017 Prius is a new breed of hybrid, with a look that speaks volumes of its efficient, effective performance. While shopping at Lipton Toyota, you will be able to browse through a large selection of vehicles in every trim level to help you find one that suits your budget perfectly. Explore the Prius V lineup, which includes the Prius V Two, Prius V Three, Prius V Four, and Prius V Five. Every 2017 Prius V features the spacious cabin and cargo areas that will help you make every drive a comfortable and convenient one. You get 34.3 cubic feet of cargo space behind the rear seats but that measurement can be expanded to 40.2 cubic feet when the rear seats are slid forward on their track. Folding the rear seats down into the floor opens up a total of 67.3 cubic feet behind the front seats. The interior of the Prius V was upgraded in its mid-cycle refresh, and more bolstering and higher quality materials were added to improve passenger comfort in all seating positions. For added versatility the rear seats feature a 60/40 split and the sections can fold independently, recline, and slide fore and aft on a track under the seats to allow you to fully customize your passenger and cargo areas. The front passenger seat can fold flat to allow you to load even long cargo items into the 2017 Toyota Prius V. Upholstery options include cloth or SofTex trim depending on the trim you select. You will find a center console with integrated arm rest and storage between the front seats, which is very helpful for storing small, sensitive items like phones, spare change, charging cables, and more. Keeping you safe and confident on the road is very important, and the 2017 Toyota Prius V is out to do just that. Standard safety equipment on every new Prius V include the Toyota Star Safety system (vehicle stability control, traction control, electronic brake-force distribution, four-wheel anti-lock disc brakes, brake assist, and Smart Stop Technology); seven airbags including a driver's knee airbag; whiplash injury lessening front seats, LATCH child seat locations in the rear outboard seats, tire pressure monitoring system (TPMS), and a vehicle proximity notification to help you park. The Prius V Five has the option for an available Advanced Technology Package that includes Toyota Safety Connect with emergency hailing and roadside assistance calling, Pre-Collision System, Lane Departure Alert, and Automatic High Beam control (this package also brings the panoramic moonroof and a few other items). Plus, every 2017 Prius V comes with ToyotaCare no-cost maintenance and roadside assistance for two years or 25,000 miles. 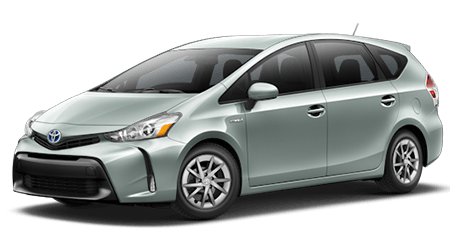 Come and see the 2017 Toyota Prius V at Lipton Toyota and explore this family-sized hybrid in person. You will find Lipton Toyota at 1700 West Oakland Park Blvd in Ft. Lauderdale, FL, so come see us today and find one of the most efficient hybrid family wagons on the market at our Ft. Lauderdale Toyota dealership. We proudly serve shoppers from Dade County, Broward County, and the surrounding areas of Florida including Deerfield Beach, Hollywood, and Weston!